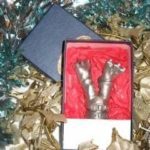 The hand crafted ogre legs bottle stopper in pewter and finished by hand with paint and cork. What happens when you mix a bottle of wine and an Ogre, 2 short of a six pack ? A drunk beast that finds himself in difficulty, that’s what 🙂 This silly boy drank so much he stumbled into the top of this empty bottle and now he’s stuck. Stopping the wine beneath. Oh wait, that’s what you’re after isn’t it. This piece would sit very nicely on a kings table or at a knights feast. If you don’t happen to be one of those, he’s not fussy, so you’re purchase will be just a satisfactory, no matter your lineage. Don’t forget that we are here to help. So if you have any questions then feel free to get in touch through the live chat box below, by picking up the phone or emailing us and we’ll help out as quickly as we can.